Like all early American periodicals, The Children’s Friend reprinted pieces from other periodicals. Here it’s reprinting a description of a frozen mammoth discovered in 1799 by an Evenki hunter and collected in 1806 by a Russian botanist. (See the article on the mammoth collected by Mikhail Adams.) Early descriptions and illustrations were … fundamental, showing the skeleton without attempting to show the actual creature. This was typical for discussions of the mammoth and the mastodon in early works for children on fossils; “clothing the bones” was complicated, with many and varied attempts. (See American Monster: How the Nation’s First Prehistoric Creature Became a Symbol of National Identity, by Paul Semonin, for some amusing examples.) Here, however, we have the mammoth pictured whole—hairy and tusked—standing before an astonished hunter. Even with the idealization, the piece informs readers about the world around us and the ways in which we’ve explored it. And, with the idealization, it gives a sense of the wonders that have always surrounded us and of the value of curiosity (and patience!). There is a vast country, of which Siberia forms a part, in the north of Asia, stretching from the mountains which separate Europe from Asia, and reaching as far as the straits which are between that continent and America. On the north of this region, which is larger than Europe, is the Polar Sea; and the great mountains—whose southern chain, the Himalayas, contains the highest peaks in the world—bound it on the south. in the museum of which it forms a most remarkable feature, Our illustration shows the gigantic carcase as it appeared to the astonished eyes of the chief, still half-encased in the ice block which had preserved it for so many years. 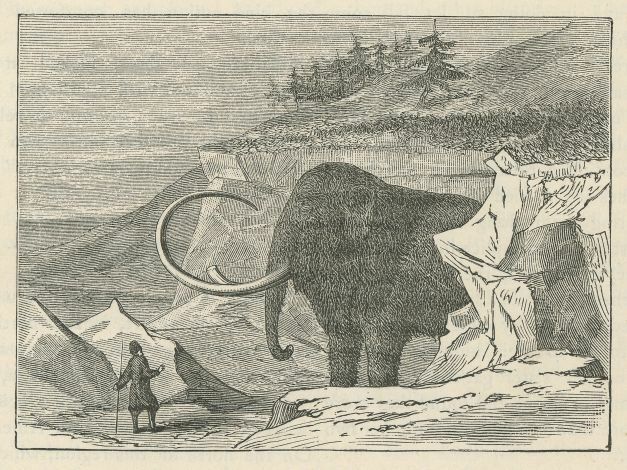 It is supposed that the mammoth lived amongst the forests of the great plain of Siberia, and that it was often overtaken by floods, and drowned.—Young Folks’ News.